Do you know what it’s like to get a little surprise now and then; Something that you’d never thought of. Something totally different from what you would normally do? But it’s a bit of fun in the end? 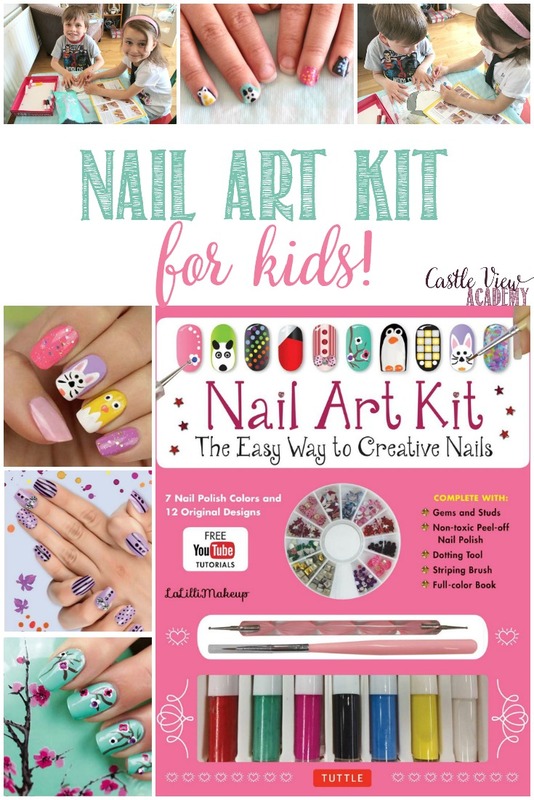 This is just what happened to us with a Nail Art Kit for kids that arrived on our doorstep, and it’s perfect for gift-giving! In the last box that Tuttle Publishing sent us, a couple of surprises were enclosed; which is always very much appreciated. Along with the Paper Dragons origami airplanes kit was their new Nail Art Kit. This certainly wasn’t something I would expect a publishing house to produce; although the do have some really nifty arts and crafts books! So we had a closer look at it. 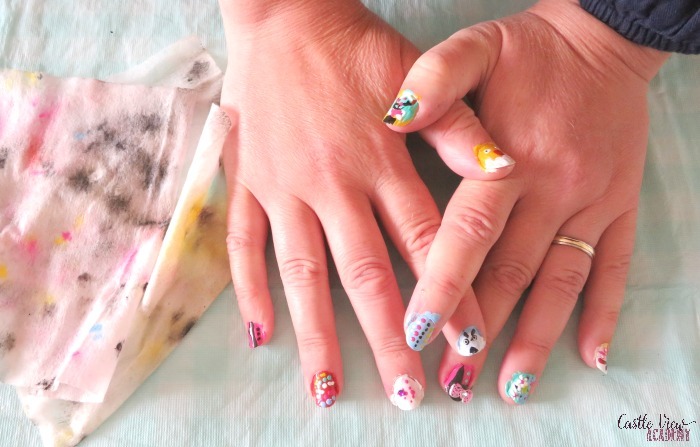 Now, strangely enough, my first knowledge of nail art was while I was in Japan during the month I was working in Kanazawa. My manager there had long nails that were emaculate and always had fun designs and pictures on them. She told me this was her way of relaxing and unwinding at home after a long day and evening at work. I wish I had a photo of them, but at that time it would have been a strange request for a film camera…I did have a camera on my keitai (mobile phone), but it was back before Facebook, Instagram, and selfies. 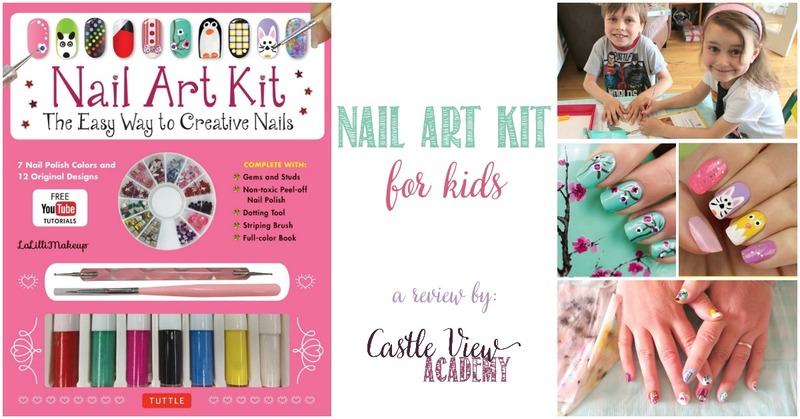 I will be honest and say that I have never put nail polish on my children as I’m not a big fan of children dressing like adults, but there is an element of art involved in this….and it’s a non-toxic, peel-off polish…so I thought we could try it out. Kallista’s nails are usually cut short for Ju Jitsu classes each week, but when this kit arrived she was on a two week break. My nails generally aren’t very long, either as they split and crack when I do dishes. But they weren’t too bad. So to ease me into the idea, Tristan and Kallista painted my nails first. The guide says it’s a 10-20 minute project…but it took them well over an hour doing one hand each! A good way to pass an afternoon! Now, what to try first? Tristan and I both gravitated towards the cherry blossoms. Kallista wanted to paint some polka dots and stripes. 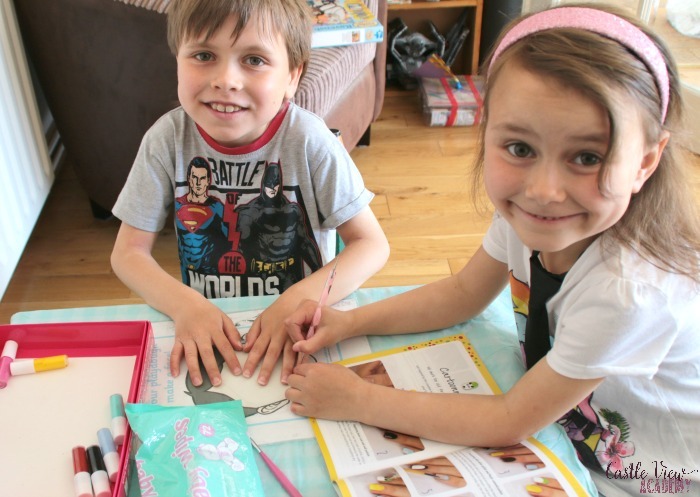 Yes, we don’t believe in ‘girls’ or ‘boys’ activities, and Tristan loves art, so he was welcome to join in. Then the kids went wild and before I knew it I had a panda bear, a penguin, a tux with tie, flowers, dots, stripes, and more! Each nail was unique, to say the least! Kallista had her cousin over for a day and they sat up at the table and did each others’ nails. It was a faster process because Kallista now knew what to do, and her cousin often has her nails painted; though not generally in such a quirky fashion. I’d like to have been there when Phil took her home and her mom saw her nails. I won’t share a picture because we don’t like to use photos of children who are not ours. Let’s just say there was a lot of colour involved! This was way more fun than I expected and we’ll be doing this again! Think of each nail as a mini canvas awaiting a commissioned piece! 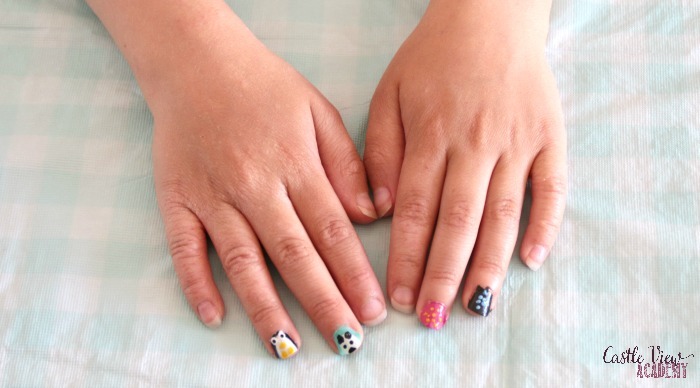 I have some little Japanese nail art decals and pieces I bought last year for crafting…but they may see themselves now being used for their intended purpose. I will also have to purchase some nail polish in bolder colours to use for more nail art projects.